Rajagopal R. Nair, one of my close friends working for Brandcom ME at Dubai, became father of a second child - a son born to wife Latha at Haripad on 24th January 2008. 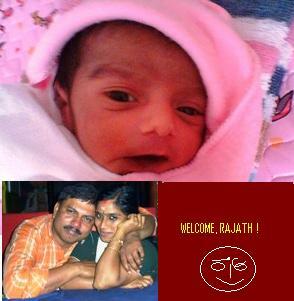 Congratulations to Raju and Latha! The happiest person in the family is Raju's elder son Rajesh! The 'naming' ceremony was held on 18th Feb. 2008. He is named RAJATH.